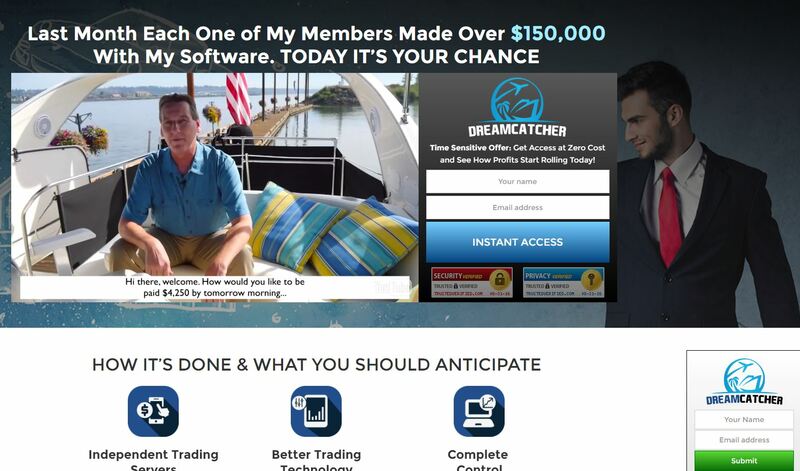 In this true review of Dream Catcher we prove that it is a scam that abuses binary options. It is presented by Matthew Warner. Warner claims to be a Wall Street trader who can give you access to a trading software that can make you thousands of dollars per day. This software trades binary options and it is called Dream Catcher. And yes, becoming a millionaire is free nowadays, so Dream Catcher is free. Let’s start with the first lie you hear from Warner. He promises you $4,250 just for taking part in a survey. But if you follow the Dream Catcher presentation to the end, there is no survey and certainly no financial reward. In fact Warner is scam artist, a fictitious character played by an actor. The only purpose of Dream Catcher is to make you trade binary options unprepared. On the Dream Catcher website you can see some testimonials, reviews and a table with allegedly live trading results of this program. But they are all fake. Look at the picture with the trades. The date corresponds to a Saturday, but markets are closed on Saturdays, so in reality nobody can trade. We did a test of the Dream Catcher trading app that you are supposed to use with your own money. And no, it is not free. After signing up you are first shown an allegedly live trade on your account with a free deposit. But it is fake. The balance is fictitious. You can verify it later, because you will be required to deposit money into an account where the real balance is zero. What’s more, this same dirty trick is used by several other binary options scams. Check the first picture, you’ll see a comparison with Instant Cash Club. This same scam uses also the same trading app, you’ll see that on the second picture. This software is in reality losing money, it cannot trade profitably. So how does Dream Catcher really work? Its only purpose is to make you open a trading account with a selected broker (Banc de Binary in this case) and deposit money into this account. Because that is what these scammers are getting paid for, they are getting paid by the broker for referring new clients. As simple as that. And the easiest way to convince somebody to send money to a certain broker is to promise a free money making software. This is also why you won’t be allowed to try the software before you deposit. But don’t do it, otherwise you will lose your deposit. Dream Catcher is an ugly scam that is made to lose your deposit that you will have to make to be allowed to use the software. So stay away from it! If you are interested in seeing how money can really be made in binary options trading, try a free demo account. There you can test and learn until you are able to trade profitably. Then you can start with real money.